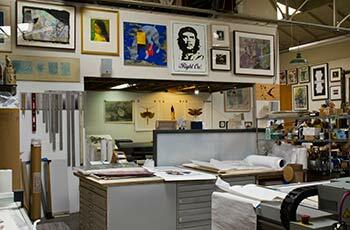 A few steps from Byron Spicer’s studio is Magnolia Editions, a fine-art print studio. Oola and I made a trip over there during the recent East Bay Open Studios. There was so much going on that it is hard to know where to start. Inside the front door is a gallery of work produced in Magnolia Editions over the years. We were greeted by a William Wiley tapestry, “No Fault Insurance”, a wry commentary on the police and politicians involved in the Amadou Diallo tragedy. William Wiley, "No Fault Insurance"
Magnolia Editions has been making it digitally possible for artists to create contemporary art in this old-world medium. More of the Gallery with a Chuck Close tapestry "Lyle"
Nick Stone, a talented and perceptive essayist, took time to let us know something about the art in the room. 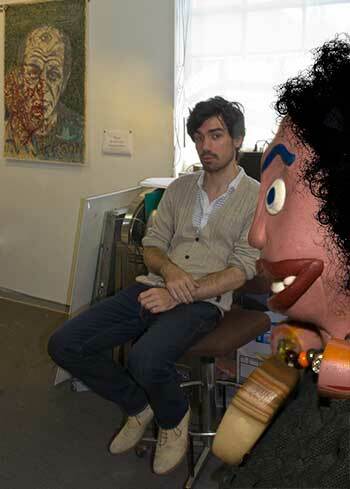 Nick Stone listens politely but skeptically to Oola's blather. 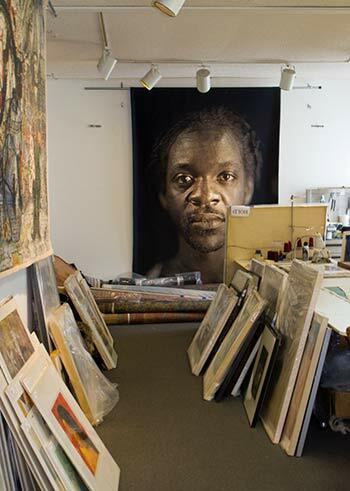 Inside the main studio, we fell into an enthusiasm of art both finished and in progress. 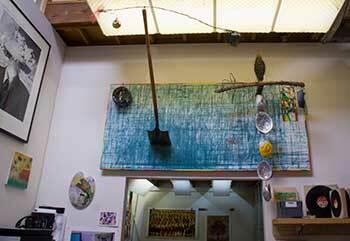 Artist who have produced work here over the years include Squeak Carnwath, Enrique Chagoya, Rupert Garcia, Joan Brown, David Gilhooly, two of my teachers – Mel Ramos and Ray Saunders, David Best, Peter Voulkos, the directors of Magnolia Editions themselves – Don and Era Farnsworth. You get the idea. This is a powerful place. Oola and I looked around. 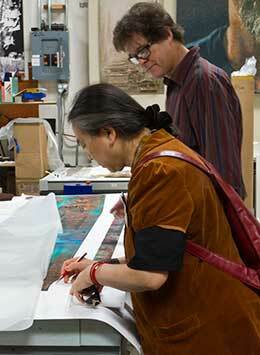 Hung Liu was signing a print while Jeff Kelly, art critic, was examining some prints. Hung Liu signs one of her prints as Don Farnsworth looks on. There was amazing art everywhere! Waaay more than I could stuff into my eyes in one visit. What I love about this place is the combining of old and new. I first visited this studio in a field trip with my teacher Misch Kohn (untold years ago) and I remember a traditional printmaking atelier with etching and litho presses. But Don is not satisfied with what he already knows. He loves experimenting and researching, and pushing the edge of the form. So now in addition to traditional printmaking you will see two large format digital pigmented ink printers, and a UV flatbed printer, 4′ x 8′, that will print on just about anything up to 1.75 inches thick, even things like weathered wood. 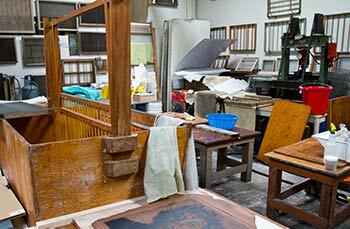 Additionally, there is a papermaking studio, run by David Kimball. 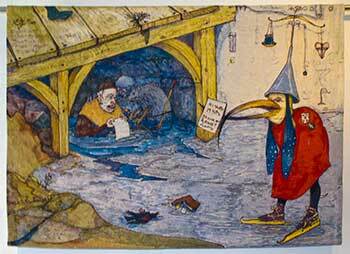 David once visited my art program in the prison and taught a workshop in papermaking. Other experimentation in Magnolia Editions involves electronic and internet investigations. 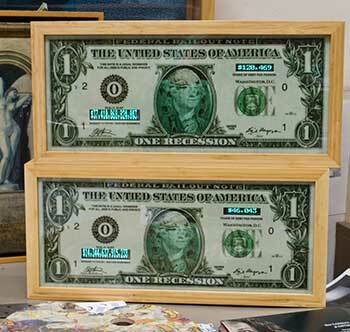 Enrique Chagoya, "One Recession Watchdog (Instant Update)"
Chagoya’s printed commentary on the the current Economy contains a wireless running update on the size of the National Debt and how much each citizen owes on that debt. Don showed us a “Fifteen Seconds of Fame” project in process that involves LED lights, lenticular lense, and internet connectivity. There was also something about using CNC to cut wood blocks for printing, and the use of the digital printer for making resists on clay tiles. 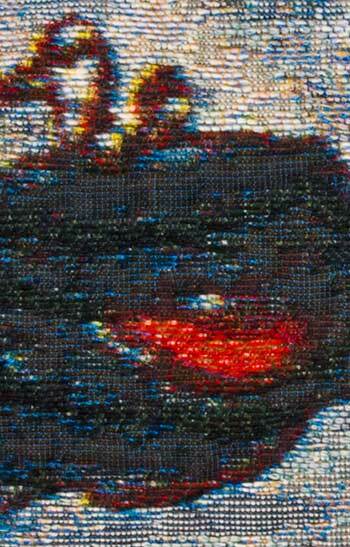 Era Farnsworth is experimenting with 3D tapestry images that you need to look at with those funny glasses. In the middle of all this, a traditional book binder adds to the mix. 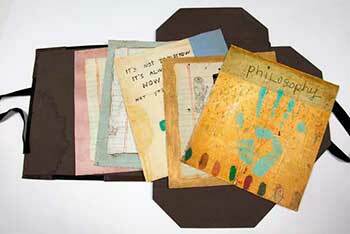 “Philosophy” is a project with physical and conceptual heft. It crosses printmaking with painting in a very REAL sense, through a flawless registration of print over a painted surface of gesso and marble dust. All the pages are then wrapped in a luscious leather-bound portfolio.